Dato’ Mohammad Faiz Azmi is the Executive Chairman of PwC Malaysia and was the leader of PricewaterhouseCoopers Global Islamic Finance Team from 2007 to September 2012. 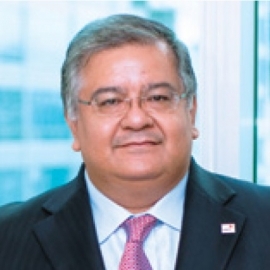 He was also the previous Financial Services Leader and joint Head of Audit for Malaysia. Dato’ Mohammad Faiz has over 30 years’ experience in the audit and business advisory services of financial institutions in Malaysia. He has also been involved in the audits of clients in the banking, healthcare, power and construction sectors. He has led a number projects relating to strategy, investigations and merger work, both locally and internationally. He is also the Project Director, leading the team on the Accrual Accounting project with the Accountant General’s office. He has also acted as the Administrator for a National Airline and on a Public Interest entity. He is a Council Member of the Malaysian Institute of Accountants, a Fellow of the Institute of Chartered Accountants in England and Wales, and a Council Member of the Malaysian Institute of Certified Public Accountants. He has held the post of the President of Malaysian Institute of Accountants, Chairman of the Malaysia Accounting Standards Board, and ICAEW City Group Chairman. In addition to that, Dato’ Mohammad Faiz is a member of The Chartered Institute of Islamic Finance Professionals and chairs the Islamic Finance Working Group of the Asian-Oceanian Standard-Setters Group. He is the Chairman of the Islamic Finance Consultative Group of the International Accounting Standards Board. He currently sits as a member of the International Advisory Panel of Labuan International Business Financial Centre (Labuan IBFC). He is the President of the Kuala Lumpur Business Club (KLBC) and Chairman of Malaysia Professional Accounting Centre (MyPAC). Dato’ Mohammad Faiz was educated in Malaysia and the UK, and read law at the University of Durham before being called to the English Bar. He is also a Liveryman of the City of London, and a member of the Worshipful Company of Chartered Accountants England and Wales. He was conferred the Darjah Kebesaran Dato’, which carries the title Dato’ in 2013 by the Sultan of Selangor. He was conferred an honorary degree of Doctor of Laws by the University of Nottingham in July 2016.